From Hubert Humphrey to slaughterhouse workers, the triumphs and the struggles of Minnesotans are captured in the photographs of Jerome Liebling His work is featured in a new book, Jerome Liebling: The Minnesota Photographs published by the Minnesota Historical Society. Liebling came to Minnesota from New York in 1949 when he was just 25. He was hired to help form the photography department at the University of Minnesota. Now 73, Liebling is in Minnesota this week to promote his book and give a slide lecture at the Minnesota History Center. 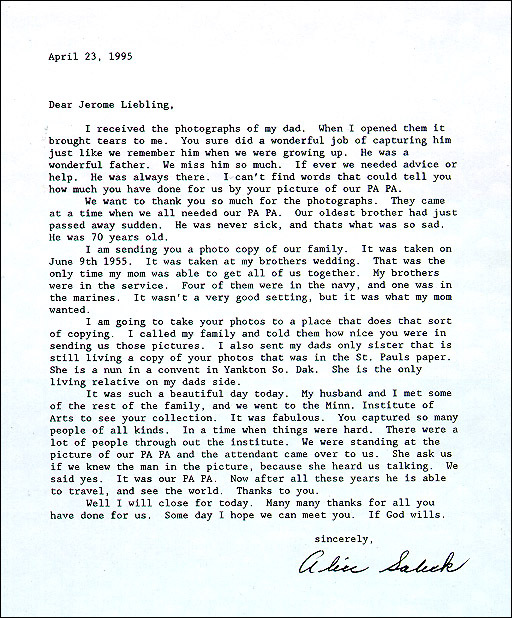 Liebling told Minnesota Public Radio's Greta Cunningham that photographs help history come to life. Liebling: Minnesota then was grassroots. You could see the origins of so many things that were present. The people working in the book - I kind of start with the grain elevators. They were very close to the University of Minnesota, and especially in the fall, when I first came, you could smell flax. It just permeated parts of the town, and you were just curious about those quiet buildings and what they did. And that was the beginning of this grassroots search. I wanted to see where people worked, how they worked and what the fields turned out and brought together. And then the entire enterprise that grows out of the natural planting and harvesting. This becomes the stock exchange or the grain exchange and the entrepreneurship. And that is something of the beat that goes on in the book. From there I went to South St. Paul and saw the stock yards. I went there for many, many years. I suppose it's kind of a blue collar search that I was making. MPR: Well, I was going to mention - your book Jerome Liebling: The Minnesota Photographs is filled with portraits of what many people would consider "ordinary" people. I'm wondering how you managed to hone in on that as your subject matter - or did it choose you? Liebling: I think it chose me. Though I don't know if I can properly answer that. It's like the chicken and the egg. I'm sure if we did some personal analysis I'd find that I was interested in so-called "common, human enterprise." That thing which is closest to us - which is the everyday, the ordinary - which I think is very, very important. We've given special attention to another order of entertainment and stars and almost fictional lives. I'm concerned about that thing which all of us pass through and touch. There is a sublime and special respect that is ordinary, but which I think I sometimes push to heights of importance. MPR: The book also has some photographs of some famous Minnesota politicians. 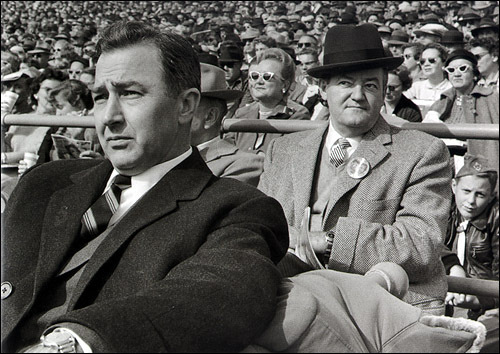 There's a wonderful photograph of Hubert Humphrey and Eugene McCarthy at what looks to be a sporting event. Liebling: Yes. Fritz Mondale - later to be vice president of the United States, but then he was just Fritz Mondale - and he had just graduated law school. He was running the campaign of Orville Freeman in 1958. He was looking for a photographer to help in the campaign. Another friend of his - who was a friend of mine - said, "Get in touch with this guy Jerry Liebling. I think he might help." He did call me and a friendship between us started then in 1958 when he was running the campaign. I found that I was excited about chasing the politicians. I was often doing photographs that I was interested in. But mostly I was attempting to do pictures for the campaign. I captured how they looked, what they did. They needed little brochures often with family members. That's how I started. I had such entrée - at least through the Democrats. I continued photographing, for many years, politicians that came through. I've done photographs of Wallace, Truman, and Kennedy. Politicians were important. I was trying to see and take a measure of the particular person. Could I, through a photograph, give some insight to who they were and what they were about? MPR: What do you think is the historical importance to your photographs? 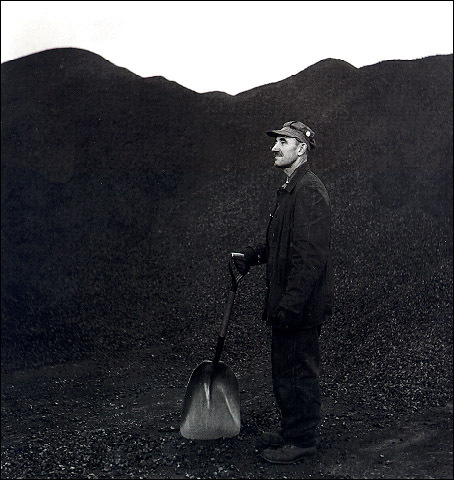 Liebling: We start the book with a photograph of a man in a coal yard. When that photograph was taken in 1951 - as do many of these pictures date from that period. It wasn't shown in Minneapolis until 1995. The picture was reproduced in a newspaper, and the man's daughter saw the photograph of her father. She rushed to the Minneapolis Institute of Art where the picture was shown, and then wrote to me a letter saying that "you brought my father to life." I'm not going to read the letter. It's reproduced in the book. It was written by Alice Salick. But she said that my father was such a wonderful, hard-working man. There seemed to be no recognition to his life except for the family and their feelings about him. And now I saw him on the walls of the Minneapolis Institute of Art. The show then traveled to London and she further said, "My father never traveled anywhere, and you have sent him to London." And I was so touched by that and to feel that I had - in some way - encapsulated his life just for a moment. Now this book is published by the Minnesota Historical Society. Of course what the Society stands for is this sense that all of the lives, all of that past, all of our history indeed penetrates whatever we do today. MPR: You have the book of photographs - and of course the photographs themselves - but you also must have a legion of students who studied under you. You taught at the University of Minnesota from 1949 to 1969. That is quite a legacy to have as well. Liebling: It's interesting - the significance of being in school and the memories you have. Everyday the newspapers are filled with stories - "The schools are failing us - Why can't young people read? - What are they learning? - Let's change the system." Certainly nobody says, "Don't bring us all together in these formative years." Since I was at the University level, I think everybody carries throughout their lives, if they had an opportunity to go to college, the thought that "Yes, I went to so and so." This is what happened to me and these are the connections. So that it's a very important moment in our lives. That coming together - that touching - that socializing. Then the career choices made because of what we've studied. MPR: Do you think you can teach photography? Or must the student have a certain talent before they come to you? Liebling: Oh, your questions are so penetrating. (laughs) Whether we're teaching or not, there's a body of knowledge concerning so many subjects. You at least get that information out. In the arts and in photography there's a term that we use called "visual literacy." Certainly you know that, within a year or two, their language is better. They know the references. So that there is teaching and there is knowledge. Whether you make everyone an important photographer - I certainly didn't succeed all the way - but every once in a while I did. MPR: What's it like to be back in Minnesota? You're in Minnesota this weekend at the Historical Society and of course telling people about your new book. Liebling: Yes. Minnesota, at least Minneapolis where I live, has changed so vastly. My photographs - talk about a grassroots - have an ability to see the horizon, to feel the horizon and that was present even in Minneapolis and certainly St. Paul. The cities were small towns. There was a sense of the small town. If you can imagine that when I photographed the skyline of Minneapolis, the tallest building was the Foshay Tower. Since then, Minneapolis - and St. Paul to some extent - has taken on a new veneer. They wanted, I think, to hide the grassroots. They wanted to become part of what they thought was a larger international appearance. So the downtown of Minneapolis has just transformed. All of these new buildings represent logos for companies - one after the other. I wouldn't dare talk about whether it's better or worse. But Minneapolis has pushed a new image of itself. It's adapted an image rather than relying on what I felt was it's own importance. So the changes are tremendous. MPR: Jerome Liebling, if people want to see the grassroots of Minnesota they can certainly turn to your new book Jerome Liebling: The Minnesota Photographs. Thanks so much for coming in and telling us your story and telling us about your wonderful new book. Liebling: Thank you very much. Images in this document are from the book Jerome Liebling, the Minnesota Photographs, Minnesota Historical Society Press, Saint Paul, MN, Copyright 1997 by the Minnesota Historical Society. 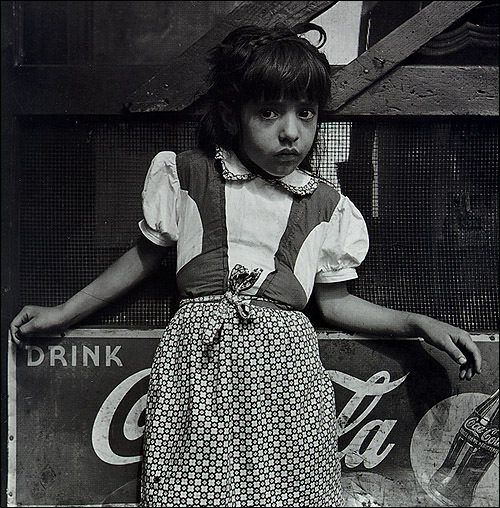 Photos are copyright 1997 by Jerome Liebling. All rights reserved by the copyright holder; used here by permission.